In Alfa Romeo rosso red with black interior and leather seats. Manufactured on 11th January 1967 and delivered to Alfa Romeo UK on the 6th February 1967, this matching numbers Duetto received a bodywork overhaul in September 1997 (13,000 miles ago) which included new front wings and central panel, replacement of the rear quarter wings and repairs to the footwell area. The engine bay was steam cleaned and the paintwork stripped back to bare metal and repainted. The bodywork remains in lovely condition. There are invoices for the work and in fact there is a very good history file going back to 1992 and MOTs to 1978. The bills cover new brakes and steering, a new radiator, new chrome and fittings and servicing by Jamie Porter in recent years. The interior and hood were replaced by Coburns some time ago and are in excellent order. The Alfa has a Nardi steering wheel and a hood tonneau. Bob Dove rebuilt the five speed gearbox in 2003 and the engine was stripped and rebuilt in 2014 including a thorough overhaul of the cylinder head. The car has covered 3,000 miles since. It is fitted with fully rebuilt twin Weber 40 DCOE carburettors with air intake mods to suit and 123 electronic ignition. The engine sounds wonderful and pulls well. 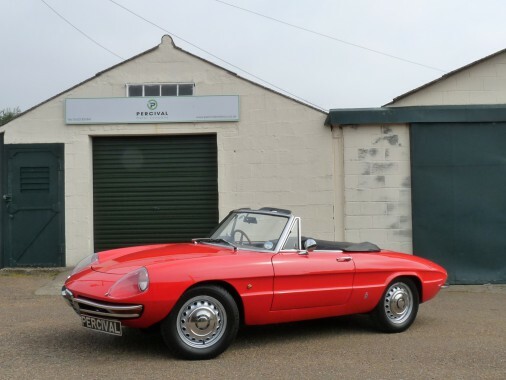 Spider is a rare, UK supplied right hand drive example, and is in very good condition throughout.